The good news is that you don’t have to fork out for tickets to the Northern Hemisphere to enjoy a Winter Christmas this year. According to Wikipedia, we owe the privilege of celebrating the silly season out-of-season to a french opera based on a german book, an American girls summer camp and an advertising campaign to send cards and gifts to World War II servicemen abroad. Let that combination stew for a few decades, and somehow “Christmas in July” is born as a way for those in the Northern Hemisphere to enjoy the spirit of Christmas in the warmth of summer. If the Northern Hemisphere can use this excuse to have a summer Christmas, we can definitely use it to have ourselves a traditional old style winter Christmas that we see in movies so often. Now with a good excuse to enjoy instead of despise this chilly spell, it’s time cuddle up with a good book, some comfort snacks, and some heartwarming Christmas tunes. Snowman Soup can be delightful! While the origin of Snowman Soup has been lost to history, we can only speculate that it’s something so deliciously Christmassy that was meant to be shared with Family and Friends. So this July, using every excuse in the book, it’s time to get in the spirit of giving, the spirit of caring, and the spirit of sharing…. a steaming hot mug of Snowman Soup. 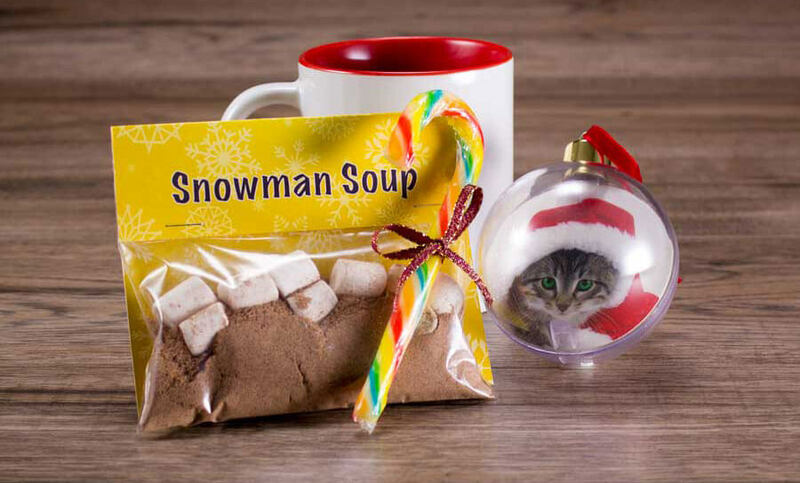 To make your own, all you need to do is package enough Hot Chocolate and mini-marshmallows for one decadent mug of bliss in a cute little bag, and top the package off with a candy cane. Here’s our version which we’re giving away with our mugs… If you’re sharing some Snowman Soup this Christmas, please be sure to show us what you created! RapidStudio's Snowman Soup with a red mug - I'm not too sure what Kitty Clause is doing there. But most of all, have a Very Merry Christmas … in July.